Absolutely hilarious is the only way to describe this gaming experience. 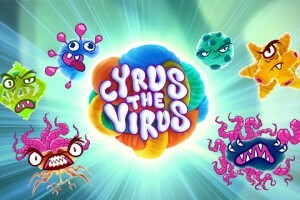 Like the name suggest, it is about a virus and other germs. Each icon is in a different shape that represents a disease. Cyrus is the green worm that wears glasses and sticks his head out from the sides after a winning spin. Yggdrasil hit the nail on the head with this game of fun ghoulish icons. The reel backdrop has a green neon glow to it along with the characters. There is a dark blue, orange, yellow, two green, one turquoise, and one light blue germ icon. They all have teeth and eyes, while some have multiple eyes or only one. 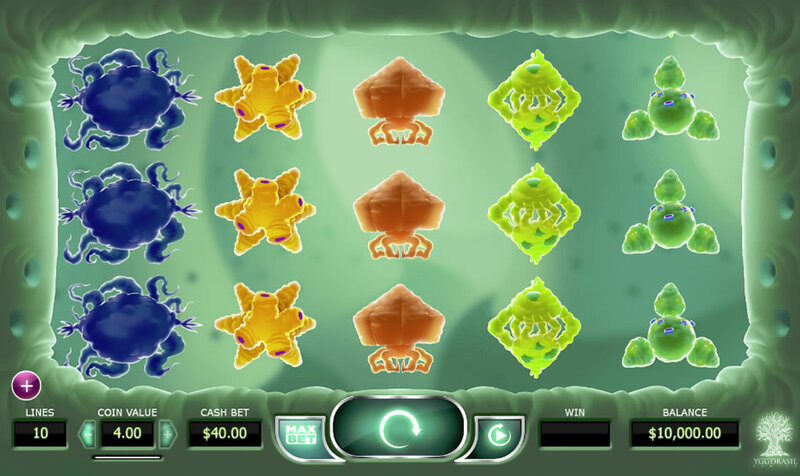 This is not your average Vegas online slots. I play them regularly so finding this one was great. There is a wild symbol along with the seven other creatures that make this game worth your time. Sounds, colors, and graphics take the game to the next level with eye candy to keep it interesting. Animation is the final touch with each icon adding their unique movement with each winning spin. The best way to explain the theme is killing a germ to win big payouts. There are five holes on either side of the reels where Cyrus sticks his head out. 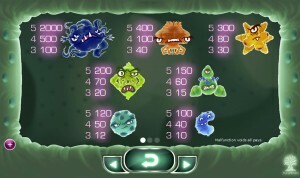 The germ icons make noises or sighs in disgust as he shoots them with green goo. More animation has them batting or rolling their eyes. Some splatter over the entire reel including the green one that grows tentacles. Cyrus can stick his head out from one to all five slots on one side at a time. He can also be seen with a surprise look on his face when there is a winning spin. I found myself laughing during the game. The sound is more like noise from outer space with a techno quality than actual music. Free online slots have come a long way with this game as an example. The payout is calculated from either side with the middle reel landing last. The highest paying icon is the dark blue blob with four eyes at 5,000 coins for five on any of the ten pay lines. The next coin payout amount runs from 400, 300, 200, 150, 120, and 100 coins when five of the corresponding icons land on any reel. There are five reels. The re-spin feature starts after the last payout from the winning spin. The wild symbol has to land in the center reel to trigger and becomes an expanding wild. The bonus is a sticking wild during the re-spin. There is no actual bonus round just a free spin. The light blue bean-shaped icon is worth the least and drops off the reels during a bonus re-spin. Wins are signified by a white line that highlights with the amount in white writing. I rate this as a top game with the funny plot and stellar graphics. This is one that can be played regularly for fun or winning real money. The reels move fast and quiet, which takes away any distractions. The payouts are consistent with one in almost every spin. The theme and sounds make this game worth playing to break up the boredom or for a laugh. 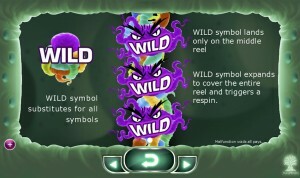 Between the sighs and crazy looks from the characters and the burst of colorful tentacles from the wild icon, players will find it hard to turn the game off. The clear display of the number of lines, bet, and coin value make it easy to change things up. I set the auto spin on 1,000 just to see how long it would take to spend the fun balance. I will not tell you what happened so you can see for yourself. SlotsClub.com has this along with other good choices.